I'm at Logan to leave for Istanbul -but I just found out that the video for our latest lecture is now ready (thanks to Thomas Ciaburri). So here it is. Dr. Barbara J. 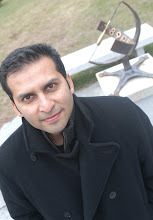 King was our Science & Religion Lecture Series speaker at Hampshire College on September 22nd. She gave a fantastic talk on the roots of our religious (or proto-religious) beliefs. Here is the video of her talk, Gorillas and God: The Evolutionary Roots of Religion (video of Q&A and the abstract for her talk below) Enjoy! 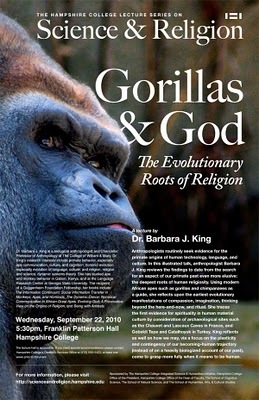 Gorillas and God: Evolutionary Roots of Religion by Dr. Barbara J King from Hampshire TV on Vimeo. Q&A with Dr. Barbra King from Hampshire TV on Vimeo. Anthropologists routinely seek evidence for the primate origins of human technology, language, and culture. In this illustrated talk, anthropologist Barbara J. King reviews the findings to date from the search for an aspect of our primate past even more elusive: the deepest roots of human religiosity. Using modern African apes such as gorillas and chimpanzees as a guide, she reflects upon the earliest evolutionary manifestations of compassion, imagination, thinking beyond the here-and-now, and ritual. She traces the first evidence for spirituality in human material culture by consideration of archaeological sites such as the Chauvet and Lascaux Caves in France, and Gobekli Tepe and Catalhoyuk in Turkey. King reflects as well on how we may, via a focus on the plasticity and contingency of our becoming-human trajectory (instead of on a heavily biologized account of our past), come to grasp more fully when it means to be human. Dr. Barbara King is a biological anthropologist and Chancellor Professor of Anthropology at The College of William & Mary. Professor King’s research interests include primate behavior, especially ape communication, culture, and cognition; hominid evolution, especially evolution of language, culture, and religion; religion and science; dynamic systems theory;. She has studied ape and monkey behavior in Gabon, Kenya, and at the Language Research Center at Georgia State University. The recipient of a Guggenheim Foundation Fellowship, her books include The Information Continuum: Social Information Transfer in Monkeys, Apes, and Hominids, The Dynamic Dance: Nonvocal Communication in African Great Apes, Evolving God: A Provocative View on the Origins of Religion, and Being with Animals. I liked it. For once, I felt people do talk about real science without jumping into unnecessary conclusions. And without mixing up prejudices and scientific findings. Thanks for posting this Salman. And many thanks to Professor Barbara King for presenting such a complex issue so clearly and so well. I wish I was in the audience for then, I would have asked her whether her talk was really about "EVOLUTIONARY" roots of religion -- if you know what I mean. :) Simply putting it as 'roots of religion or proto-religion' would have been more appropriate, i think. Puttin it as "Evolutionary" roots is the thing she was avoiding, I thought. Nevertheless, it was nicely done and an interesting talk. Thanks Ali. I think her evolutionary connection comes from the fact she is looking at proto-religious qualities in primates other than humans. If you are interested in the topic of the scientific study of religion, check out this lecture by David Sloan Wilson: Evolution and Religion. This is from the first year of our lecture series. Funny that you mentioned DSW. I've attended his updated version only this month. :) I also read his blog (sometimes). That reminds me. Have you thought of joining 'Science Blogs?' I don't know whether there are any advantages. But, just a thought -- because DSW's blog is on it. Ali - yes. we are currently other platforms, but we want to make sure that the blog ends up at the right place so we don't have to move again. But thanks for suggesting it! Nice, grounded talk. Tthanks for posting these, Salman.